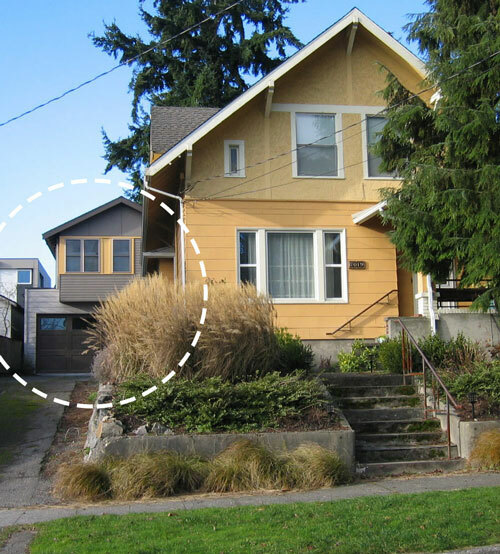 Photo courtesy of City of Seattle: Legislation that would make it easier to construct accessory dwelling units, such as this backyard cottage, is being delayed by an appeal. The Queen Anne Community Council hosted nearly 100 residents from Queen Anne, Magnolia, Ballard and other nearby Seattle neighborhoods for a lively discourse over affordable housing in regards to Seattle City Councilmember Mike O’Brien’s accessory dwelling unit proposal. The Nov. 1 meeting was an opportunity for the Queen Anne Community Council to discuss its appeal against the city’s final environmental impact study for O’Brien’s proposal to make it easier for people to construct attached and detached accessory dwelling units on their properties. The city published its FEIS on Oct. 4, which finds O’Brien’s plan would have no significant impact on Seattle if approved and executed. QACC member Marty Kaplan, who led the community meeting, said the community council is concerned the FEIS was not “nuanced” enough and should have focused more on each Seattle neighborhood individually. For the last 20 years, attached accessory dwelling units and detached accessory dwellings units (AADUs and DADUs) have been legally built in Seattle neighborhoods with certain restrictions. O’Brien did not respond to a request for comment left with his office. • Allow a property to have both an AADU and DADU with the existing building envelope. Currently owners of single-family homes can only have one ADU on their lot. • Remove requirements for off-street parking. A property owner would still be able to provide an off-street parking space if desired. “Removing this requirement will allow some properties who have insufficient space for an additional off-street parking space to add an (ADU),” the city’s website states. • The new plan would require owner-occupancy for one year, and then the requirement would expire. Current the homeowner must occupy the main dwelling unit or the ADU. • Reduce the minimum lot size for a site with a DADU from 4,000 to 3,200 square feet. According to O’Brien’s site, approximately 7,300 more lot would become eligible to build a DADU. • Increase the maximum gross floor area of a DADU to 1,000 square feet, excluding garage and storage areas. Right now legislation caps gross floor area in a DADU to 800 square feet. The maximum for an AADU is 1,000 square feet. • Increase rear yard coverage to 60 percent for one-story ADUs. • Allow DADU entrances on any facade provided it is 10 feet from the lot line if located on facades facing the nearest side or rear lot line, unless abutting the right-of-way. • Increase the maximum height of a DADU or an AADU by 1 to 2 feet, which would make two-bedroom DADUs feasible on more lots. • Allow exceptions from height limits for projections (such as dormers) that add interior space. Kaplan, who called himself an advocate for “respectful legislation,” said the community council and other neighborhood leaders were concerned about the lack of parking requirements, a perceived lack of research done within neighborhoods near downtown, the one-year requirement of owner occupancy in the proposal and the lack of affordability requirements. About 30 people spoke during the meeting, asking questions and expressing their support either for the appeal or O’Brien’s proposal. Matt Hutchins, the founder of the grassroots organization More Options for Accessory Residences, is against QACC’s appeal and fears the appeal process is delaying a necessary change in the city. “We are looking at how these nontraditional forms of housing can help with our big housing crisis,” Hutchins said. Hutchins formed the group a little more than a year ago, in response to O’Brien’s proposal. “We knew the ordinance was happening, and we wanted to bring together people who felt strongly that this is a good solution,” Hutchins said. Hutchins came to the Nov. 1 meeting with many other group members, who wore bright blue buttons with “MOAR” on the front. Hutchins said the EIS doesn’t state there is no impact, but that there is no significant impact on the city. Many residents at the meeting said they were more afraid of “McMansions” being built in their neighborhoods rather than smaller housing units. Greenlake resident Tyler Smith said he lives in a single-family home with three other minimum wage workers, and a duplex across the street from his rental was recently demolished. Now a large home is being built there. Queen Anne resident and MOAR member Leah Missik said she can’t build a DADU for her elderly parents because she can’t provide parking. If O’Brien’s proposal is approved, she would be able to build one and bring in more income. Calvin Jones, a renter from a nearby neighborhood, said millennials and people from low-income groups are being excluded from neighborhoods like Queen Anne. The Queen Anne Council will meet before the Seattle Hearing Examiner for a pre-hearing meeting at 10 a.m. Thursday, Nov. 8. For more information about the appeal, visit qacc.net.